There is little doubt where 'western' media stand with regards to the U.S. led coup-attempt (vid) in Venezuela. But their view does not reflect the overwhelming international recognition the Venezuelan government under President Nicolás Maduro continues to have. 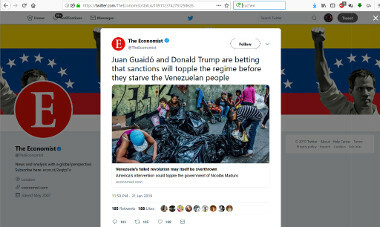 The Rothschild family's house organ, the Economist, changed the background of its Twitter account to a picture of the Random Dude™, Juan Guaidó, who the U.S. regime changers created to run the country. It is quite obvious that Trump’s Illegal Regime Change Operation Will Kill More Venezuelans. The Economist supports that starvation strategy. The supposedly neutral news agencies are no better than the arch-neoliberal Economist. The Reuters' Latin America office also changed its header picture to Random Dude. It reverted that after being called out. Agence France-Press stated at 11:10 utc yesterday that "tens of thousands" would join a rally. That was at 11:50am local time. The attached video did not show "thousands" but some 200 people mingling around. Hours later a pro Random Dude rally took indeed place. From what I gathered it was attended by some 50-80 thousand people. (Others calculate less.) Flags of the United States and Israel were raised: 1, 2, 3, 4. Pro Chavismo rallies took place in several Venezuelan cities. These were not billed as anti-coup demonstrations but as commemorations of the 20 year anniversary of socialist policies. That might have effected their size. The rally in Caracas was attended by some 20-30 thousand people: 1, 2, 3. The New York Times report on yesterday's events in Venezuela mentions the pro-government rallies only in paragraph 33 to 35 of its 37 paragraph long story. 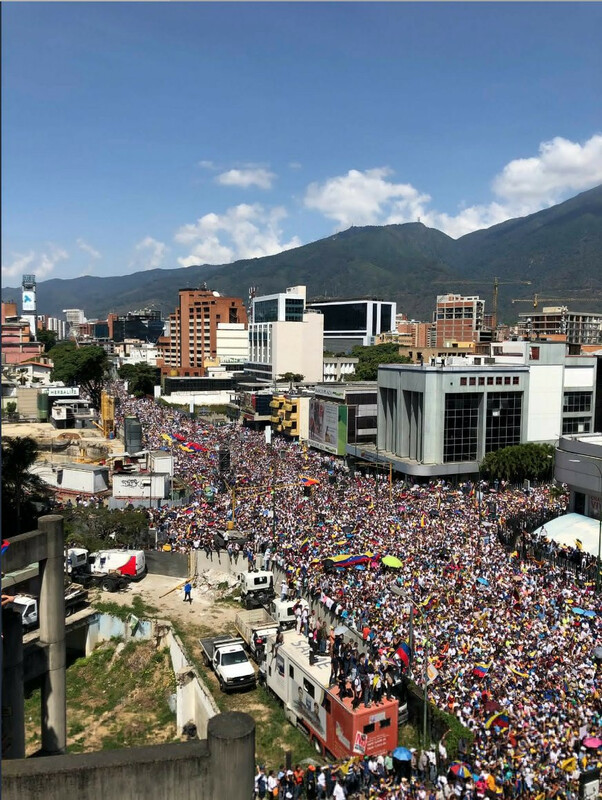 The pro-government demonstration in central Caracas had drawn about 300 people by 10:30 a.m. Dressed in red and carrying ruling party flags, they were marching toward the presidential palace. The rally took place after noon. How many people walked somewhere at 10:30am is irrelevant to the total participation. The pictures prove that the venue where the rally took place was indeed quite full. During his speech Maduro called for new elections to the Venezuelan parliament, the National Assembly. The parliament, currently not functional as the Supreme Court blocked its power for not following its judgments, is controlled by the opposition. Secretary of State Mike Pompeo said last Saturday that we would be prepared to donate an initial $20 million dollars to the Red Cross, to the UN High Commission for Refugees. So we’re looking at all this very carefully. [Random Dude] said that in the coming days, the opposition would try to move humanitarian aid into the country by land and sea along three border points, including the Colombian city of Cucuta. He described the move as a “test” for Venezuela’s armed forces, which will have to choose if they allow the much needed aid to pass, or if they instead obey the orders of Maduro’s government. The 'aid' must be thoroughly checked before it enters the country and the government should take care to distribute it evenly. During the war on Syria so called 'humanitarian aid' from Turkey, Israel and Jordan was used as cover for large scale weapon and munition transports which mostly ended up in the hands of Jihadists. For now, Venezuela faces a government weak in the economic and social arenas, but with strong judicial and military institutions. This will be the case unless —weakened by international pressure— Chavismo’s emerging fissures gather momentum and are able to undermine the government’s stability. However, as long as the U.S. government’s strategy operates on the basis of threats, Chavismo will have a reason to remain strong and unified. The U.S. failed to get sufficient international support for its recognition of Random Dude as president of Venezuela. So far only Canada, Israel and 14 Latin American states took its side. A few European nations are slowly following. The efforts were unsuccessful, garnering only 16 favourable votes out of the 34 countries, with US allies Guyana, Santa Lucia, and Jamaica abstaining. The United Nations Secretary General Guterres announced that the UN only recognizes the Maduro government. Italy blocked a European Union recognition of the Random Dude while the EU parliament, which has no power in foreign policies, followed the U.S. position. The EU now only demands new elections to be held sometime in the future. The African Union supports Maduro and spoke out against the coup attempt. Russia, China, NATO member Turkey, South Africa, Iran and Syria spoke in support of the Maduro government. The media are misleading on the international support. On February 1 Reuters headlined EU states move to recognize Venezuela's Guaido: diplomats. But the piece itself contradicts the headline. It found only four out of twenty eight EU states, Britain, France, Germany and Spain, that were expected to announce support. On February 4 the Washington Post headlined European nations recognize Guaido as Venezuelan leader but the report says that only Spain, France and Sweden took that step. The Guardian also headlines: EU countries recognise Juan Guaidó as interim Venezuelan leader but names only five countries, Spain, France, the UK, Sweden and Denmark, one of which is poised to leave the EU. In total the 'international support' the U.S. led coup attempt has gained so far is quite thin. It has no international legitimacy. Unfortunately only few if any of the 'western' media will point that out. The image of this Guaido makes one think unvoluntarily of those calaveras that mexicains put everywhere on la Dia des Muertos ,with a candle inside. Thanks for your articles on Venezuela.Please don't forget to watch the hallucinatory events developing in France:Parliament authorizing preventive artrests,power given to the prefects to arrest anybody on suspicion of wanting to demonstrate.Police pursuing and searching redaction of internet journal that posted audio of Benalla andcompany in flagrant delit,etc.etc. Trump will probably announce a US war on Venezuela later on in his speech that he is going to give. That might be the reason he have already sent so many thousands of troops to mexican border past days. He’s a regular at the village pub, where some drinkers think he should be the local MP — or prime minister, both positions once held by a local, now forgotten, politician called David Cameron. Clarkson has consistently dismissed the idea of involving himself in politics, even when 50,000 of his fans voted via the government’s e-petition website for him to be prime minister (the petition was rejected on the basis that governments don’t decide who gets to No 10). What makes it think that it has any right to decide who resides in the Miraflores Palace? The clearest explanation I have read so far of the unconstitutionality of Guaidó's claims: The Failure of Guaido’s Constitutional Claim to the Presidency of Venezuela. Forward it to your family, friends, and co-workers who think the Empire and its vassals are "restoring democracy" in Venezuela. The Constitutional claims forwarded by Guaido are just a pretext, and are being cherry-picked to justify what has always been considered a "new administration" rather than a caretaker government whose sole purpose is to arrange new elections. In Washington, Guaido's representative is already outlining big changes in economic policy. He is saying the "new" government has three initial priorities, of which new elections is third on the list: "The envoy said the top priority is restoring political stability, followed by rebuilding the economy. He said he hopes elections can be held by year-end." i.e. there is no intention of elections in the near-term, and there likely never was. Central banks have little power. They are merely the monetary agencies/departments of governments. They could easily just be part of Treasury in the electronic money era. The politicians have the real power. As I have written about here many times, the central banks are private and owned by the same folks that own the BIS, IMF, World Bank and the SWIFT system. These same folks "own" a big number of the politician in Western governments that you say have all the power. This private ownership of the global tools of finance and politicians in Western governments has been going on now for centuries and the whole Central Bank part of the Western nation forced architecture is Empire's way of extending "democracy". Rules of private ownership of property and inheritance are part of the Western package of a hierarchy of oligarchs in nations and globally all tied together by the central banks you say have no power. I watched Oz's weekly Govt-approved ration of RT News on TV last night. It was 13 minutes duration, down from 90+ minutes a couple of years ago. RT confines their TV broadcast to headlines and promoting items and stories on the RT website. The biggest news was that RT has interviewed Maduro, which apparently involved asking Maduro questions and then letting Maduro answer them himself. RT now has an article on the Maduro interview. I was wrong, Venezuela wasnt really mentioned in Trump's speech. I guess the regime change will need some more speed at this moment if this is going to be quick, perhaps the coming days we will see something? The french win the hypocrisy award for the day. They recalled their ambassador to italy - due to "meddling in elections."